LONGUEUIL, Quebec — With two flicks of the wrist, Simon Rocheleau sent a lunar rover spinning in the dirt. 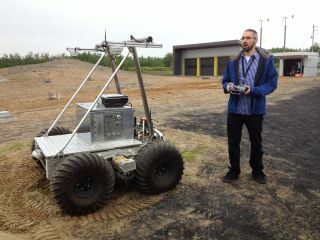 The Juno rover prototype — operated by a remote control in Rocheleau's hand — was skidding here at the Canadian Space Agency (CSA) headquarters’ Mars Yard, a backyard playground of dirt and rocks where robots can simulate missions to the Red Planet. "They learn some of the thought processes of the scientists, and how they go about selecting targets," Rocheleau, a member of the CSA's robotics and engineering group, told a visiting group of journalists from the Canadian Science Writers' Association on June 6. Rovers like Juno could play a prominent role in the future of the CSA, which is looking beyond the expiration of its commitment to the International Space Station in 2020. Although Canada could remain active on the station project long beyond that date, the agency is cultivating its options. Rovers and robotics appear to be among the most promising directions, officials said. In 2009, the CSA received a onetime boon from the federal government: 110 million Canadian dollars ($108 million) in stimulus funding to develop promising space technologies. By inviting the private sector to bid for contracts, the agency hoped to assist struggling companies until other business picked up again. Most of that funding went to two projects: one to develop a successor to the Canadarm series of robotic arms used on the space station and space shuttle, and another to create rover prototypes. Both of those projects were finished in 2012, and the agency is now shopping for buyers of the technology. External money will likely be needed for further development, as the agency's budget has been dropping steadily. The Canadian federal government, conscious of the deficit racked up in the wake of the recession, has been slashing more and more money from many of its departments to address the gap. Next year, the CSA’s budget could fall to as low as CA$258 million to CA$260 million ($253 million to $255 million). In comparison, the agency's budget for 2013-2014 is about CA$309.7 million ($304 million), down 20 percent from 2012-2013. Now, officials at the agency hope to make use of the rovers and robotic-arm prototypes. Sometimes, students practice with the rovers. Ultimately, though, the agency is recalibrating its approach to space missions to make the most of these new technologies. Side by side in a bunkerlike CSA corridor are two rooms with very different visions of Mission Control. The Exploration Development Operations Centre has rows of desks with computers facing a big screen. On the TV, real-time video plays from the International Space Station as well as from Mission Control at NASA's Johnson Space Center in Houston. Currently, the room is used to help run experiments on the station. "When you're dealing with human spaceflight, it is very procedural," said Ken Lord, manager of CSA's exploration ground infrastructure. "Everything is written down, step by step, and you don't deviate as you go through the iteration." Two steps down the hall, the Robotics Operations Mission Centre has a big table in the center of the room. Computers and desks stay on the periphery. The layout, although it's still an experiment, is supposed to encourage scientists to work more collaboratively. "It's a more consultative type of approach," Lord said. Rover missions often produce unexpected findings; they discover rocks or other ground features, he added. The CSA used the stimulus funding as background information for a strategy to test exploration technologies, Lord added. Rovers represent one of those approaches; robotic arms are another. Every station astronaut must go to the CSA for preliminary robotics training. The recruits have two weeks to learn the basics of controlling the Canadarm, Canadarm2 and Dextre robots before moving on to more advanced work. A large mock-up of the station's U.S. Destiny Laboratory — the site of one robotics workstation — sits in a training room at the CSA. "I like to call it the best video game out there," said Mario Ciaramicoli, the CSA's operations manager. "You need to get a good score, as it goes on your astronaut file in Houston," Ciaramicoli said. Last fall, the agency unveiled several Next-Generation Canadarm prototypes that could facilitate work such as in-orbit refueling of satellites — an idea that the humanlike Dextre robot is already testing out in orbit. Meanwhile, with Canadian astronaut Chris Hadfield just returned from Expedition 35, astronaut training attention at the CSA is shifting to younger, unflown recruits. David Saint-Jacques or Jeremy Hansen could fly to the space station as early as 2016.